With all eyes on marketing’s ROI, marketers need to figure out not just what they get for what they spend, but also what to do in order to continuously improve the rate of return. In this webcast, Kevin Clancy will present brand new statistics on the ROI of different kinds of advertising, from traditional to search. He will highlight the biggest areas of opportunity for improvement and discuss ways B2C and B2B marketers can go about improving the effectiveness of communications programs. Marketers, it’s time to fuse your marketing with Emotion Potion. Behavioral and digital data are overflowing these days, yet most marketers are unsure how to turn this abundant information into true insights. While data from loyalty cards, digital clickstreams, and CRM databases tell marketers WHO their audience is and WHAT they are shopping and buying, they can’t fully unlock the WHY behind consumers’ complex behaviors. Emotional forces drive decision-making, and when evoked, emotions forge deep, enduring brand loyalty. In this webinar, our panel of thought leaders will lay out the steps to achieving a holistic consumer understanding by integrating attitudinal and emotional data assets with behavioral data sets. By the end, marketers will have the recipe to building brand loyalty through engaging shopper marketing programs. Our prior webcasts will describe how to get a 360°, unified, and provocative understanding of your target consumers. The next step, then, is to draw inspiration from these insights and to generate breakthrough ideas for brand strategy, product/portfolio plans, creative strategies, and your communications plans (including paid, owned and earned media). But, this is easier said than done. Peter Krieg will describe the challenges marketers experience using “data” and insights, and suggest five steps that will ensure that your deep understanding of the consumer leads to successful innovation. In this four-part series, learn how to leverage consumer attitudes (survey data), behaviors ("big data") and emotions (neuroscience) to better segment, target and connect with your customers' hearts and minds. Today brands have access to more and bigger data about their customers and prospects. In this webinar, Eric Paquette will describe how to develop a market segmentation that leverages behavioral “big data,” primary marketing research data and third party marketing data to develop a harmonized “single view of the consumer” that can guide overall brand strategy while leveraging the power of actual behavioral data and highly targeted activation and communications strategies. Marketers have witnessed an explosion of applied neuroscience techniques designed to answer questions about emotion and motivation that traditional rational marketing research can’t answer. As such, many CMOs are looking for guidance in making sense of the myriad of “System 1” techniques, and in understanding which techniques are best suited to address their strategic needs in innovation, positioning, ad testing, and branding. In this webinar, Jeremy Pincus, Ph.D., will identify the advantages and limitations of these techniques, and describe a new applied neuroscientific approach, MindSight®, that transcends past limitations by speaking directly to the emotional brain. With the rapid pace of technology, access to real-time data, and the proliferation of consumer touchpoints, the world of marketing is being disrupted like never before. What used to be simple media flowcharts have exploded into complex, omni-channel consumer ecosystems. But all is not lost… while marketing has never been more challenging, it also has never before offered the ability to understand – and connect with – our consumers deeply and wholistically. In this webinar, Jeffrey Maloy will outline the challenges and opportunities facing marketers today and identify the ways in which enlightened marketers are embracing the changes and maximizing human understanding. In this four-part webinar series, "360 Degree Consumer Understanding" you will learn how to leverage consumer attitudes (survey data), behaviors (“big data”) and emotions (neuroscience) to better segment, target and connect with your customers’ hearts and minds. Most marketers recognize the future of marketing is in organizing big data around the customer; analyzing and synthesizing it into actionable insights; and applying these insights to marketing decisions. Across industries and categories, CMOs are looking to marketing analytics for help. In this webcast, Copernicus’ CEO Peter Krieg will draw from his experiences with leading brands around the world and post-mortem observations of where analytics projects have gone awry to highlight five big picture considerations for CMOs. Learn best practices for using marketing mix modeling to measure, monitor, and optimize your marketing investment from special guest Irina Pessin, Managing Partner of marketing effectiveness consulting firm Data2Decisions US. • Which factors have historically contributed to sales? • What has been the sales effect of the various marketing mix activities? • What was the ROI from marketing activities? • What is my profit maximizing budget? • How do I optimize brand and channel weight and selection? In addition, she will illustrate how traditional marketing mix modeling has evolved to accommodate bought, owned, and earned media channels to create an even more comprehensive and powerful evaluative tool. A critical element of any marketing mix optimization exercise is understanding how different media channels work together, build off each other, and how they directly or indirectly contribute to sales. Given the increasing complexity of reaching and engaging customers effectively as media channels shift in priority and preference, having a deeper understanding of the synergistic performance of all channels substantially improves the ability to optimize current and future media plans. In this webcast, Rolf will demonstrate how to assess and evaluate the effects of different media on each other. Very importantly, he will describe how to translate and apply these insights to media decisions. He will include examples of how marketers have used a more comprehensive knowledge of how media works for their brand in the Bought, Owned, and Earned media environment to develop more effective plans. It’s the Holy Grail of marketing mix optimization in the bought-owned-earned media landscape—a virtual marketplace that makes it possible to evaluate the ROI of current marketing and media plans. Many marketers also are using this tool to simulate innovative marketing strategies and plans they have never tried before and forecast the likely results. • Establishing the marketing or business problem you are trying to solve, and identifying when these types of models are most appropriate. • Understanding and modeling how "agents" (e.g., consumers, businesses) behave, interact, and network. • Optimizing the current mix across the bought-owned-earned media landscape. •Testing alternative targeting, messaging, marketing, media, and competitive response scenarios using a dynamic simulation tool. Jeff will offer perspectives on the types of questions this tool can help marketers solve, and provide examples of how brands have used it for marketing mix optimization and improved ROI. In this webcast, special guest Phil Burroughes, commercial director of retail and shopper marketing agency rmi, will tackle the often confounding topic of understanding the journey shoppers take as they move along the path to purchase. Challenging the current thinking in the industry, Phil will demonstrate how a change in planning principles can drive sales and awareness for a brand in retail channels. He will describe a simple model that can help marketers isolate the frequently-missed key moments in shopper journey planning, as well as a two-stage approach to engaging retail partners and shoppers to optimized sales. Retailers and manufacturers are aligned in their quest for improved foot traffic and increased market baskets. To this end, it pays for marketers to dive deeper into the reasons shoppers have for visiting a (physical or online) store. This "trip mission" greatly influences the choice of channel, and the types of marketing and promotional tactics that are effective in driving sales. By fully understanding the different types of shopping occasions, marketers can deliver retailer- and channel-specific planning guidance to improve sales. In this webcast, Jeff Maloy will describe an approach marketers can use to classify consumer buying occasions and develop a richly-descriptive typology for the channels and “media” they use. More and more brands that primarily sell through retail also use their websites to sell direct to customers. A brand’s ecommerce shoppers, however, not only differ in important ways from their retail targets, but also from each other. Understanding these distinctions is critical to optimizing site effectiveness. In this webcast, Eric Paquette will describe tools to identify, size, and profile a brand’s ecommerce shoppers and develop strategies to drive increased sales. - Measure how your site delivers against those needs. In the digital age, capitalizing on the biggest opportunities to move shoppers towards your brand and drive sales in different channels requires relevant, executable knowledge of how to most effectively reach and engage target shoppers. In this webcast, Peter Krieg will discuss an innovative approach to shopper marketing strategy development that drives sales, profits, and brand equity. He will demonstrate how you can apply profit-driven insights to enable highly effective digital programs and improve integration with overall brand strategy. To more effectively use digital communications channels and integrate online and offline marketing efforts, marketers often do research to better understand the habits, behaviors, and activities of their most profitable targets. The big challenge comes not from getting good, comprehensive information, but taking it the next step and using it to guide strategy and planning. In this webcast, Kevin Clancy will describe how to study these targets in terms of their digital behavior, investigating the extent to which they use the web to better inform their buying decisions and to communicate with like-minded people everywhere. He will focus in particular on guidelines marketers can follow to ensure digital insights will not only drive strategy, but also the successful execution of that strategy. While most marketers agree that social media listening can provide important real-time insights about trends, unmet needs, and campaign and new product performance, they continue to wrestle with the best way to sift through the volumes of consumer-driven conversation in order to find the truly valuable information that can guide marketing decisions. In this webcast, special guest Rolf Olsen, Marketing Sciences Director at communications planning powerhouse Carat US, will offer some key questions to ask and answer to help you formulate your own social media listening plans. Throughout his talk, he will weave in examples and case studies to illustrate what other brands are doing with data and insights gathered from listening efforts. “Ultimately the brand resides in the minds of its stakeholders,” branding guru Kevin Lane Keller once wrote. Yet in today’s “cluttered” world, it is difficult to occupy any place in customers’ minds, let alone a differentiated and superior position. The challenge for B2B and B2C marketers is to develop and execute a unique, ownable, and consistent brand strategy that will take hold and endure. In this webcast, Jeff Maloy will describe how you can ensure the brand strategy you develop will reach your target customers and be reinforced in their hearts and minds. He will present a framework for aligning the 7 critical components of a brand strategy, as well as offer a process for translating this strategy into execution. • The framework and key components of a compelling, cohesive, and powerful brand strategy. • How to successfully manage the transition from development to implementation. • Criteria to use to evaluate different executional elements–from logos, to new products, to ad campaigns. Many marketers refer to customers who love their brand and want to tell others about it as their "brand advocates." Long prized by marketers because they spread positive messages about brands through word-of-mouth, brand advocates have received increasing attention because of the digital tools now available to spread those messages more broadly, quickly, and creatively. In this presentation, Eric Paquette will describe approaches you can use to assess advocacy and identify your brand advocates. He will also discuss how to understand what you want to communicate about your brand to them--often not the same messages that you would typically share with your broader target audience. He will also discuss case studies showing how other marketers have effectively identified, reached, and impacted brand advocates. While every marketer on the planet may share the same goal to grow sales, market share, and profitability this year, they each have to map out the most effective way for their brand to get there. You could start at the top of the marketing funnel, for instance, and focus on increasing awareness and distribution. But do you expand brand penetration with a stronger positioning or a lower price? Or do you step up purchase frequency and dollars per purchase with a more satisfying product or service, enhanced promotional activity, loyalty programs, etc. Or work on both? 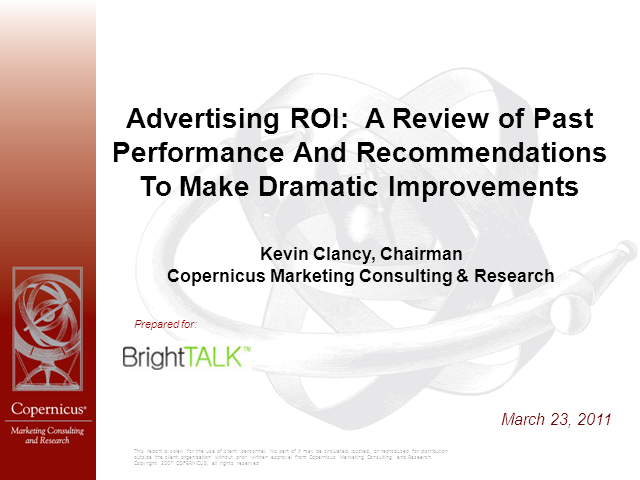 In this webcast, Peter Krieg, President & CEO of research-driven marketing consulting firm Copernicus, will describe a process for setting aggressive objectives for your brand and demonstrate the steps to take and analyses to do during the marketing planning process in order to achieve them. • Create a simple, but effective “model” of how your marketing works. • Pinpoint if the drag on your brand’s performance comes from your targeting strategy, advertising creative, brand positioning, or the product itself. • Realistically estimate how many people will ever even become aware of your campaign. • Concentrate your attention and marketing resources on those activities which will have the greatest ROI. With over three decades of experience consulting to leading B2C and B2B companies around the world, Peter will give you clear and practical guidance to eliminate the expense of real-world trial-and-error and move your brand more quickly along the right path to growth. It’s that time of year again, when anyone and everyone puts out their prognostications about trends and predictions of what will hold the focus of marketers’ attention in the year ahead like holiday cookies on a platter. Marketers are all hungry for direction on how to translate information about trends into actions they can take to grow their brand or business, and Kevin Clancy has some practical how-to suggestions. • Creating a motivational brand vision that both rallies and focuses the entire company. • Discovering how long-term demographic trends will impact the performance of their brand or company. • Learning how to typologize both buyer segments and channels of distribution in order to maximize the power of marketing programs. Tune in to learn about what you can do in January to take advantage of new opportunities in 2011 and beyond. Lively, topical webcasts for B2C and B2B marketers. Tune in for helpful how-to information and big-picture perspectives on burning marketing and business issues from Copernicus' digitally saavy senior consultants and guests.